When dealing with any legal issue, you want the peace of mind that comes from an attorney who gives you their full attention for the entire case. You want a lawyer you’ll be able to reach when you have questions. I focus on giving each client personal attention so you know where you stand with your case. Terry Dodds works hard on behalf of clients who need help with a personal injury claim. He is committed to working towards the best possible outcome for victims who have been injured due to someone else’s negligence. Terry knows how an accident can change your life. Hire an Attorney Who is Accessible. I want to know your questions and concerns so that we can work on your legal matter together. You’ll be able to make informed decisions about your legal matter, because I’ll discuss your options with you. I’ll be accessible and ready to help answer your questions so that you know the status of your case and what to expect. I draw a line in the sand and stand firm with my clients. Terry represented me in a family law matter. He was very knowledgeable in family law and took on any disputes that arose relative to my case. Terry and his staff are good with communications with all parties involved even during his move to start up his own practice. All attorneys have more than one client and excel in the law pertaining to your case, but you are the one that knows your situation in detail, so for the best outcome, work with him and thoroughly do what is asked of you, and it will save you money. I was looking at 8 years in DOC. Because we hired Terry I now have probation. I have a record and was eligible for extended term. He helped show the prosecutors that I was more than just a criminal on paper but a person who made mistakes. I would recommend Terry Dodds to any friend or family member that was in need of a lawyer no matter how bleak their situation may seem. The team at Dodds Law Office is fantastic. They handled my difficult case with tenacity and gave it the attention it deserved. Without Terry and Jeanette, I wouldn’t have been able to get such a successful ending to a three year legal battle. I am thankful for their hard work and superior attention to detail. If you need an attorney that will fight until the job is done, Terry Dodds is your man. When I do go to trial, I prefer to educate my jury about the particulars of my client's case and attempt to get them to relate to my client's predicament. My Goal is to win the jury over by relating to them in ways that allow them to trust what I am telling them and enable them to see the flaws in the opposition's case. I like to chip away at the opponent's case in the best way I believe will accomplish these objectives. When you hire an attorney to help you with your case, you want to know that your lawyer will work hard on your behalf from the moment the case begins. I take a comprehensive approach to your case and try to develop strategies that I hope will best educate others about my client's situation. It has been my experience that this best maximizes the client's chances of a positive outcome. There’s too much on the line when it comes to your future to leave these critical decisions up to chance. When you hire a dedicated and caring lawyer, you can have confidence in how your case is being managed. You should never have to worry about the progress of your case. I keep you informed so you know what to expect and can make informed decisions when the time comes. You’ll have a partner in me as we explore all possible avenues in our attempt to obtain a successful resolution to your legal matter. From the onset of your case, you will know how your case is likely to unfold and what your rights are. Any legal matter is a serious one that requires the commitment of an attorney who knows the landscape and cares not only about the outcome but also about your experience. 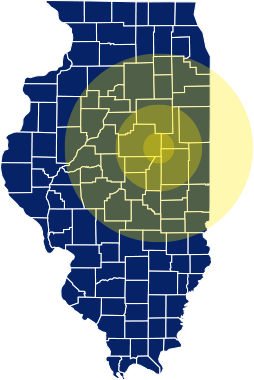 Working with clients in the Bloomington, IL region, and surrounding areas. Helping legal clients throughout Bloomington and nearby areas with prompt and dedicated service. Whether you're at Illinois State University or just living life in Normal, I can help you no matter the issue. Involved in a legal issue in Decatur or surrounding areas? My office serves clients effectively. Injury, criminal, divorce, and workers’ comp cases are handled for clients in Champaign. Assisting the citizens of Peoria with cases involving personal injury, workers comp, other types of injury claims, and those charged with misdemeanor and felony offenses. On February 17, 2009, Officer Michael Toles of the Bolingbrook Police was working when he claimed he injured his back. Officer Toles filed a workers compensation claim. Over the years, it has been difficult to digest how judges and courts will twist and turn caselaw to obtain the desired result they want in a particular case.